Enlarged, enhanced and internationalized edition of the first restoration ecology textbook to be published, with foreword by Dr. Steven Whisnant of Texas A&M University and Chair of the Society of Ecological Restoration. 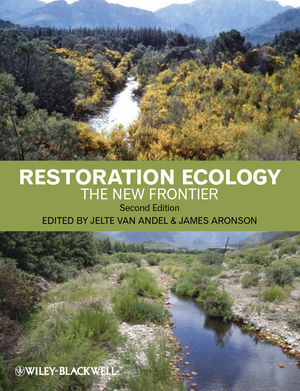 Since 2006, when the first edition of this book appeared, major advances have taken place in restoration science and in the practice of ecological restoration. Both are now accepted as key components of the increasingly urgent search for sustainability at global, national, and community levels – hence the phrase 'New Frontier' in the title. While the first edition focused on ecosystems and landscapes in Europe, this new edition covers biomes and contexts all over the world. Several new chapters deal with broad issues such as biological invasions, climate change, and agricultural land abandonment as they relate to restoration science and ecological restoration. Case studies are included from Australia, North America, and the tropics. This is an accessible textbook for senior undergraduate and graduate level students, and early career scientists. The book also provides a solid scientific background for managers, volunteers, and mid-career professionals involved in the practice of ecological restoration. Dr Jelte van Andel is Professor of Plant Ecology, recently retired from the University of Groningen, the Netherlands. His interest in the fundamentals of plant population ecology and vegetation dynamics increasingly includes the applicability of concepts and theories to problems facing society, aiming at improving the communication between scientists and citizens. Dr James Aronson is a researcher in restoration ecology at the Centre d'Ecologie Fonctionelle et Evolutive (of the CNRS), in Montpellier, France and research associate of the Missouri Botanical Garden, USA, where he helped found the Restoring Natural Capital Alliance. He is a representative-at-large of the Society for Ecological Restoration. Colour plate pages fall between pp. 144 and 145.